The journey of a Shimansky diamond direct from South African mines to your finger, magnificently shining with brilliance in a perfect setting, is quite something to behold. Along this remarkable journey, the rough diamond goes through several processes – each skilfully perfected. In its rough form, a diamond has potential. 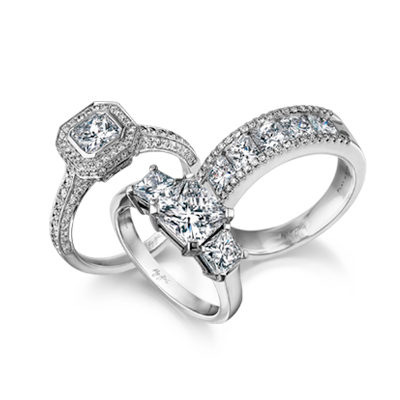 Only in the hands of a master craftsman does the diamond realise its true potential. Hand-selected at the mine by Founder and CEO, Yair Shimansky, the rough diamonds are taken to the Shimansky Diamond Cutting and Polishing Workshop, situated in the Clock Tower at the world-famous V&A Waterfront in Cape Town. It’s here where a fine eye for detail, a delicate hand and years of experience come together to create something truly magical – the breath-taking works of art known as Shimansky diamonds. Before we delve into what it takes to be a diamond cutter, let’s distinguish between a lapidary and a gem cutter or diamond cutter. A lapidary is an artisan who forms gemstones or minerals into decorative items using cutting, grinding or polishing techniques. These kinds of stones are often found at curio shops. Diamond cutters, on the other hand, are highly trained craftsmen who specialise in cutting diamonds by hand in the most precise and technical manner using state-of-the-art equipment. Only a very small percentage of diamond cutters will reach the skills level of Shimansky’s master craftsmen. These individuals have certain traits and talents in common that allow them to excel in their trade. Aside from being highly focussed, Shimansky’s diamond cutters are fastidious perfectionists who hold their work to extremely high standards. This is crucial, considering the high value of the diamonds they work with and the fact that the slightest miscalculation or mistake will negatively affect the diamond’s ability to reflect light, thereby lowering the stone’s value. Since Shimansky’s mission is to offer nothing less than perfect to our clients, our master craftsmen are all handpicked to ensure we get the best skills and talents in the world. This allows us to create diamond cuts that leave even the most experienced diamond buyer with the finest eye for detail, breathless. WHAT DOES IT TAKE TO BECOME A DIAMOND CUTTER? Becoming a certified diamond cutter involves completing an accredited diamond-cutting training programme. However, this is only the beginning of the long road to mastering this fascinating craft. The answer to how to become a diamond cutter involves talent, dedication, attention to detail, passion, perseverance, patience, focus and the ability to be your own worst critic. Diamond cutting is not only an art, but also a very exact science, which needs to be planned with mathematical precision. It takes about six years to become fully proficient as a diamond cutter. However, to master the art of perfecting a Shimansky patented diamond cut, takes a rare, immaculate skill that can only be obtained by years of experience and apprenticeship. HOW DOES A DIAMOND CUTTER DO HIS WORK? What does it entail to be a Shimansky diamond cutter? And what is it like working for a market-leading brand and creating patented diamond cuts that are highly sought-after all over the world? One can imagine that cutting and polishing Shimansky diamonds is both a thrilling and rewarding experience – one that fills these craftsmen with an immense sense of pride. And yes, that is indeed the case. Shimansky diamond cutters are truly exceptional in their trade. These gifted perfectionists don’t just cut the “standard” diamond cuts that all jewellers cut – they are the only craftsmen in the world to cut Shimansky’s patented diamond cuts. But in order to understand the true nature of this extraordinary craft, one needs to grasp just how intricate the Shimansky patented diamond cuts really are. Once you discover the mysterious wonders that take place behind the scenes in the world-famous Shimansky Diamond Cutting and Polishing Workshop, you will know the answer to how to be a diamond cutter – one that can create the most brilliant cut diamond in the world with complete confidence. When you have a closer look at the Brilliant 10 diamond through the Ideal Scope, you will see that the diamond’s perfectly proportioned, symmetrical 71 facets are shaped in a precise and calculated technique that unleashes the diamond’s brilliance and fire in full. This world-famous cut reveals a perfect ten arrow pattern when viewed from above and a perfect ten heart pattern when viewed from below. The meticulous precision commanded by this intricate cut is something that only the very best diamond technicians in the world can achieve – and a skill that is highly valued at Shimansky. This is because a diamond’s cut is one of the most important factors in determining its value. When a diamond is cut and polished to perfect proportion and symmetry, all of the light that enters the stone is reflected back through the top, delivering a brilliance visible for life. However, when a diamond is polished too deep or too shallow, light will escape from the sides resulting in less brilliance. The highly specialised skills of our diamond cutters and the high standards of quality control in the Shimansky Diamond Cutting and Polishing Factory put Shimansky diamonds among some of most coveted and highly sought-after gemstones in the world. HOW DO YOU KNOW YOUR DIAMOND IS CUT WELL? The Diamond Grading Report will contain a cut grade of Excellent, Very Good, Good, Fair, or Poor. The diamonds that are in the highest demand by seasoned diamond buyers are GIA “Triple X diamonds”. These rare and valuable gems have an “Excellent” grade on Polish Grade, an “Excellent” grade for Symmetry, which equals an Overall Cut Grade of “Excellent” –the “Triple X”. To experience the fascinating world of Shimansky diamonds first hand we invite you to visit us at the V&A Waterfront’s Clock Tower for our famous diamond tour. Aside from marvelling at Shimansky’s master craftsmen perfecting their work, you can browse our range of beautifully cut and polished diamonds and magnificent diamond rings, each of which is a treasure made timeless by years of training and dedication. Purchasing a Shimansky diamond you can be sure that you are acquiring a one-of-a-kind work of art that has been crafted by hand.